ASH, what do you want to know? …Obama Care, a first MPN look…Meetings: Town Hall in Houston, CR&T in NYC….Stem cells revisited. For us, it’s a very big deal. The biggest. After a year of rumor and leaks, claims and hopes we’re finally going to see what the near future shape of MPN treatment holds in store for us. 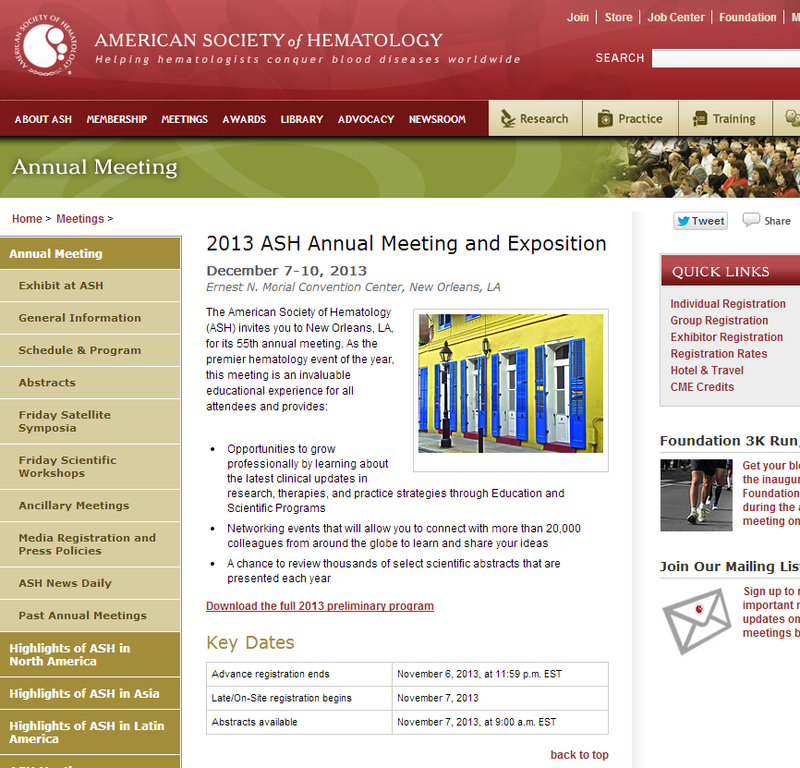 It’s the 2013 meeting of the American Society of Hematology in New Orleans, the world’s largest concentration of blood scientists and physicians bumping up against the bruised Bourbon Street culture of America’s storied Gulf Coast city. Every hotel, every restaurant jam packed with hematologists. Somewhere in that hive of activity are the results of MPN clinical trials and preliminary research. Posters, meetings, and presentations lay out the possibilities for our relief and ultimate cure. MPN is a small sliver of ASH activity, one of the smallest, but one of the most active thanks to the explosion of research and drug development following the introduction of blockbuster JAK2 inhibitor drugs. And this year, the supporters of MPNforum are again sending an editor to represent them at the event…so step right up and present your questions. You can see the whole ASH program now right here and if you come back again at 9AM on November 7 you can read the abstracts of papers to be presented. It might seem like a homework assignment but the payoff is a lot more than a grade, it’s a better shot at health and peace of mind. There are some key studies we’ve been following Momelotinib, the Gilead version of CYT387, and Sanofi”s Fedrartinib (SAR302503) along with Imetelstat and Promedior’s PRM-151 and others like the Fatigue Project. There are people we want to interview – never easy in a crowd – and videotape to bring back a rounded perspective of the multi-day event . So… what are you interested in? Let us know and we’ll add it to the wish list as we start assembling our ASH schedule. E-mail’s best, ourMPNforum@gmail.com, phone sometimes works or post to Facebook. Now that the United States government is more or less open for business again and we’ve had a few weeks to explore the Affordable Care Act it’s time to open the discussion. No politics, please, just shared experience, facts, and ideas that might help each of us find our best way forward toward effective and affordable medical care. Just for openers, Take the MPNforum Poll and let’s see where we all stand now, We can pick up the discussion next month. Two meetings in November sharing some of the same presenters and commercial sponsors, addressing the same MPN patient audience, couldn’t be more different. 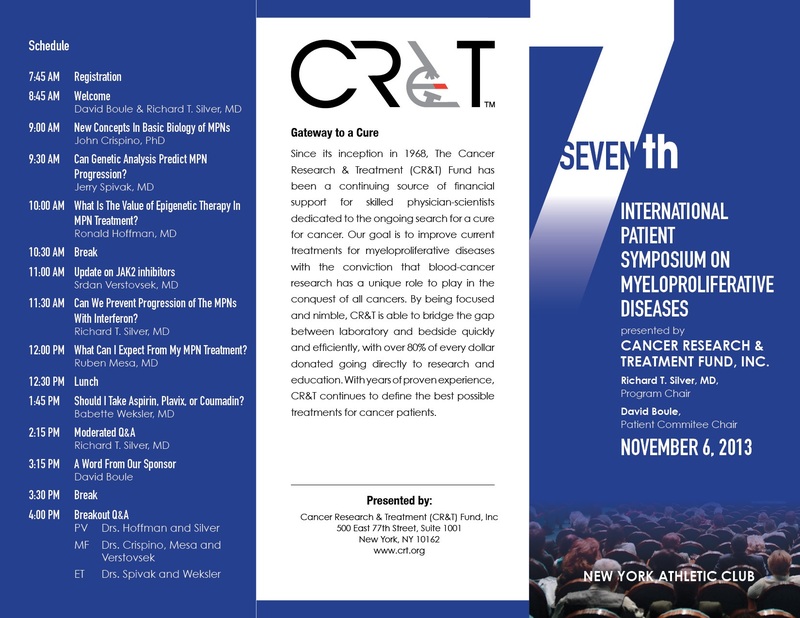 One is the venerable CR&T Patient Symposium – so venerable it still holds on to the MPD label – taking place November 6 at the toney New York City Athletic Club (jackets required). For full details, click on the graphic to enlarge. MPNforum’s Mary Cotter and Jamie Strause will be covering the event. 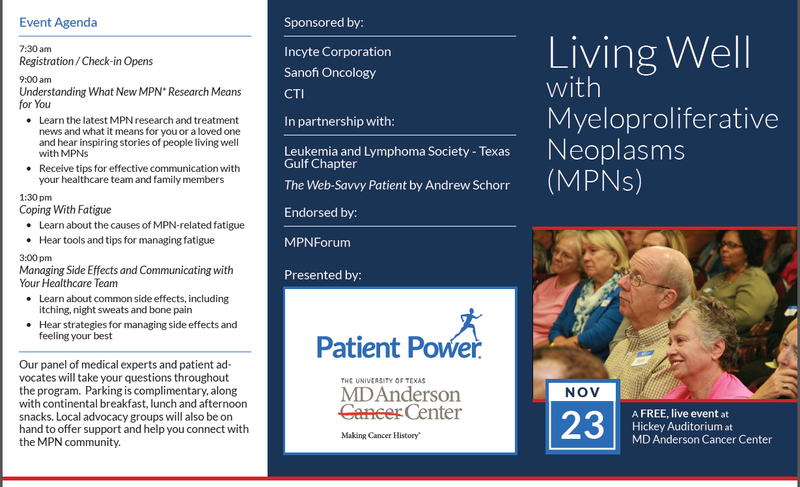 The other is a hybrid event, November 23, on the MD Anderson campus in Houston produced by newcomer Andrew Schorr’s Patient Power, a commercial medical news reporting web service with the backing of Incyte, Sanofi, and CTI. The brochure carries the endorsement of MPNforum, an endorsement based on deep regard for Dr. Srdan Verstovsek, presenting at the event, and appreciation for Andrew making the event available without fee to MPN patients, courtesy of his sponsors. Meeting flyer available here. If you head on out to either event, you can share your experience right here with your story, photos and video. Practically all of us, as we came to terms with our own MPNs, adopted the conventional wisdom that there is such a thing as a pluripotent (able to to be many things) hematopoietic (blood-producing) stem cell. These HSCs divide to produce three main blood lines – red, white, and lymph – through various pre-cursor cells. We have enough on our plates coping with the dysfunctions that characterize our own specific MPNs — and explaining our diseases to friends, incredulous interns, family health docs and even some newly minted hematologists. Why complicate things by exploring the issue of different stem cells? In seeking clarity about the root causes of our blood diseases, we can look to the distant past. Like a beacon shining down through the years, there is the wry wit and wisdom of a young oncologist sharing his experience in a book Morphology of the Blood and Marrow in Clinical Practice, available to illuminate the subject. He wrote:”The blood cells originate from undifferentiated primitive cells, also known as stem cells. 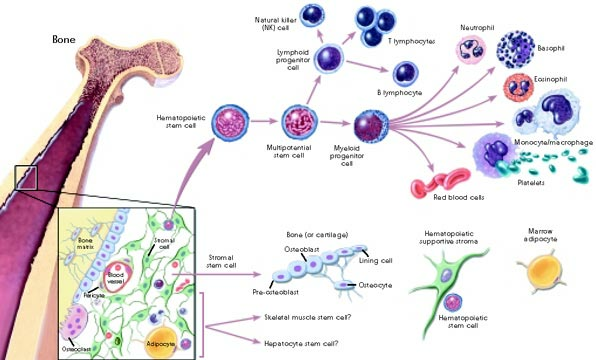 The question of whether all hematopoietic cells originate from a common cell or whether there is a different stem cell for each cell line is more of academic than practical important, for it is difficult if not impossible to distinguish one stem cell from another. The name finally assigned to these cells often depend upon the more mature cells accompanying them , the location in which they are observed, and on the name, rank and bias of the examiner.” These are the conclusions — based on direct observation of stained biopsies under limited power microscope — of Dr. Richard T. Silver published 42 years ago! We do know more now, but the process is on-going. The more differentiated our ideas of HSCs cells are the more likely we can devise agents to block or stimulate interactions that cause our MPNs and repair the disorderly pathways causing our symptoms. Found the stem cells revisited clip interesting and informative…..thanks!